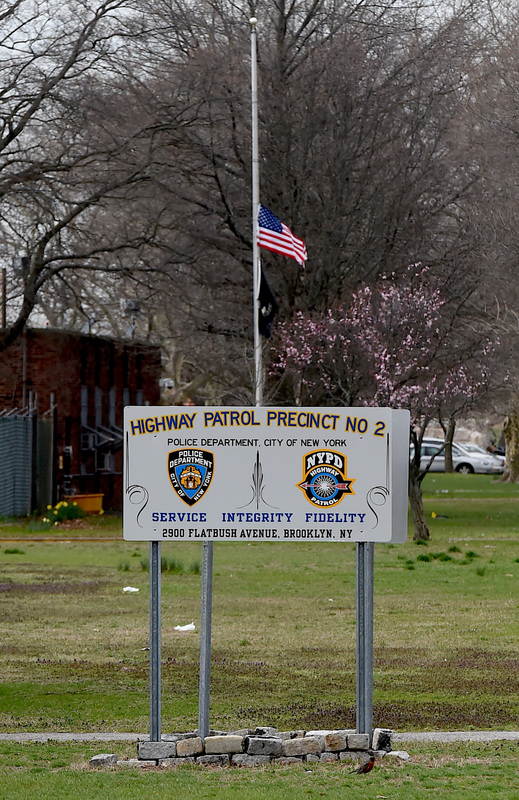 BELT PARKWAY – The flag at Highway 2 on Flatbush Avenue in Brooklyn was lowered to half-staff after Highway 2 Police Officer Marc St. Arromand was killed yesterday morning on the Belt Parkway on the way to work. He is a Long Island resident. On April 11th at around 5:30 a.m., Arromand was riding his motorcycle on the Belt Parkway in Queens near Merrick Boulevard. According to cops, he lost control of his motorcycle, crashed into a metal guardrail, and was struck by a car. He was pronounced dead at the Franklin General Medical Center. The driver remained at the scene and no arrests have been made. Arromand was 42 years old. He left his wife Cecilia and five children Sa’Niyah (11), Cayla (9) Michael (4), Daniel (2), and newborn Jason. Arromand was a 14-year veteran of the NYPD and worked on the Highway Patrol Unit 2, which is based on Flatbush Avenue and patrols roadways in Brooklyn. A GoFundMe page has been set up for Arromand’s family. Currently, over $32,000 have been raised. You can donate here.